One of my resolutions for 2011 is to write on the Web log every single solitary day. I am going to skip no more days! That means we are going to have to cover inane topics far afield of Leonard Pennario, but so be it. If I am going to get this book done, which I plan on doing momentarily, I cannot be brilliant every day, I am sorry. With which, another thing I did this New Year was make Irish cream. I was flirting with the idea of making this for about a week because I had this heavy cream that I wanted to use up. But at first I was missing a crucial ingredient, which is sweetened condensed milk. I have never bought that in my life as I can recall. It sounds like something my mother would buy. But not me! Also I was horrified at how fattening Irish cream is. It has to be the most fattening thing in the world, bar none. Piously I decided I would not make it. The last thing I need in my life is this stuff hanging around. I was at Budways shopping for my mom and I was in the baking aisle and there it was. Sweetened condensed milk! Shur Fine, of course, pictured above. As if controlled by an outside force, I bought two cans. I did not have to use it, I told myself. 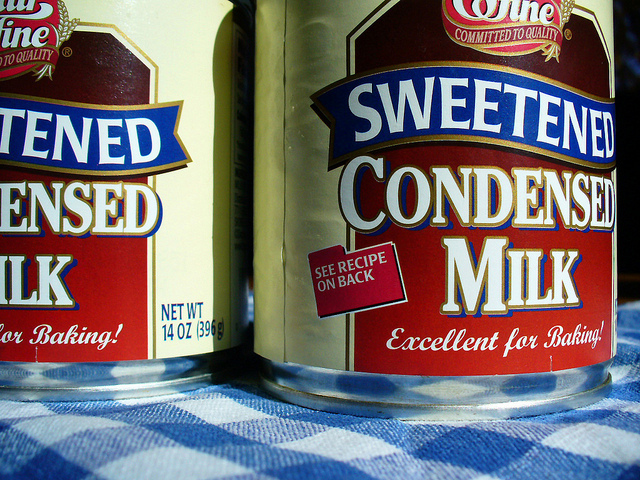 One blogger somewhere had written, "Sweetened condensed milk has a shelf life of roughly a thousand years." A few days passed. It was New Year's Eve, suddenly. There was no stopping me, suddenly. I found the sweetened condensed milk and opened the can. It was this strange stuff, though I tried some on a spatula and I know this sounds awful but there was something about it I liked. Well, milk and sugar, what is not to like. 300 calories a swallow, what is not to like. In went the heavy cream. A teaspoon of coffee granules. (That was a challenge. It took forever to find this jar of instant coffee I had bought but never opened.) Vanilla extract. And some cheap bourbon whiskey I had. Some of the commenters on the recipe had written that it was too strong, they had halved the whiskey. Not me! This might be the only time in my life I made Irish cream and I was going to do it right. While I was in the middle of making my Irish cream the mail showed up and it included the January issue of Martha Stewart Everyday Food. It was the Light Issue. Ha, ha! That was not something I was going to open anytime soon. That Light Issue could wait! When I was done with my concoction I took a sip. It was exactly like Bailey's Irish Cream. You could not tell the difference! Now if I could just stay away from it! Reading your blog every single day will make me very happy! So nice of you, Bing! !